Previous reports said the Chinese basketball celebrity was in touch with Jay Cohen, an independent filmmaker in Hollywood and the two are planning to establish a film finance fund, according to TheWrap.com, a showbiz news website. “It is still under discussion and we haven’t made a decision yet,” Zhang told reporters. Cohen mentioned his cooperation with Yao Ming while being interviewed last week about his comment on Chinese film director Zhang Yimou’s latest work, “The Flowers of War,” said TheWrap. Cohen said during his interview that the Chinese market is different from Hollywood, where the focus is firmly fixed on the bottom line. But he is optimistic about the business. 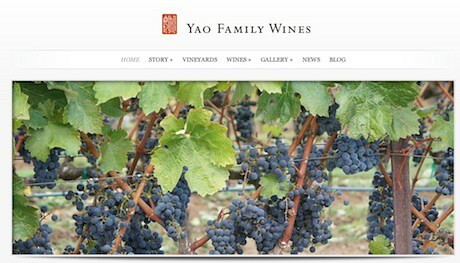 You can checkout the new “Yao Family Wines” web site here that just launched today for more information about Yao’s new wine company. NOTE: the web site may be getting overwhelmed with traffic since Yao linked to it from his Facebook page, which has over 1.1 million followers. So if the web site is down, try to visit again later. ST. HELENA, Calif., Nov. 28, 2011 — /PRNewswire/ — Yao Ming, recently retired NBA star, owner of the Shanghai Sharks and humanitarian, announced today the establishment of his new Napa Valley wine company: Yao Family Wines. 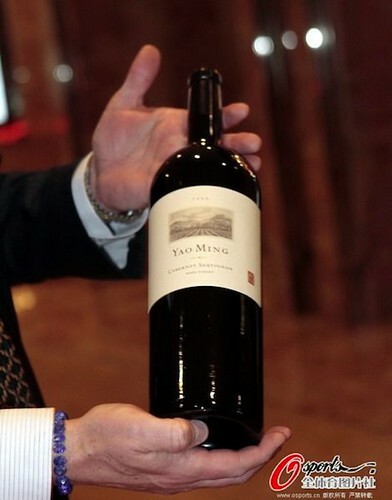 The company has released its inaugural wine under the brand name YAO MING®, a 2009 Napa Valley Cabernet Sauvignon. Yao Family Wines sources the grapes for its YAO MING® Napa Valley Cabernet Sauvignon from prestigious Napa Valley vineyards with a reputation for excellent fruit. Director of Winemaking, Tom Hinde, notes “We work throughout the growing season to ensure low grape yield, rich flavors and optimum ripeness in the fruit to fully express the extraordinary terroir of Napa Valley. We hand harvest from individual blocks and use artisan techniques throughout the winemaking process to allow the character of the vineyards to speak in the wines.” The wines are aged exclusively in 100% French Oak barrels for at least 18 months. Individual barrels from each lot are hand selected by taste for the final blend. The label for the YAO MING® 2009 Napa Valley Cabernet Sauvignon was designed by Chuck House, the celebrated California wine label designer. It features a hand-drawn illustration of Napa Valley with the ancient Chinese character for “Yao,” elegantly representing both cultures in which Yao Ming has made his home. The YAO MING® 2009 Napa Valley Cabernet Sauvignon is available in China immediately and will be available in the United States in 2012. For more information, please visit the Yao Family Wines website at www.yaofamilywines.com. On Sunday night in Shanghai, Yao Ming attended a Special Olympics East Asia charity gala where several items were auctioned off, including the first bottle of wine from Yao’s new winery. The bottle of wine and a Salvatore Ferragamo shoe last from custom-made shoes recently made for Yao were auctioned off for 200,000 RMB together (US $31,000). 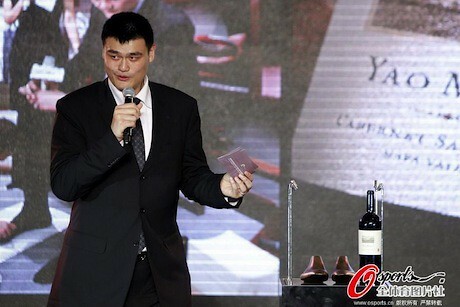 Yao’s most recent Facebook post states that the wine made up about US $20,000 of that total. A total of 2.89 million RMB (US $450,000) was raised at the charity auction. Well done! Click here for more photos from the charity gala and auction, thanks to Raymond in China. Meanwhile, the Wall Street Journal came out with an article today that goes into more details about Yao’s entry into the wine making business. It’s clear that Yao is in the business for the long haul. This week Yao is launching his own wine intended exclusively for the Chinese market. It’s a 2009 Cabernet Sauvignon produced in California’s Napa Valley. Checkout the video interview of Yao from the Wall Street Journal. There is a discrepancy regarding the price. In the Marketwatch video, it’s reported that it will sell for $298 (U.S.), whereas the China Daily article reports the price is double. We’ll see. Regardless, Yao’s Napa Valley wine company will make its debut Sunday night at an auction for Special Olympics East Asia. Raymond reports that on Thursday in Shanghai, Yao’s Shanghai MAXXIS Sharks announced a deal with Li Ning where the Chinese company will design, produce and market jerseys, shoes, sneakers and other products for the team. 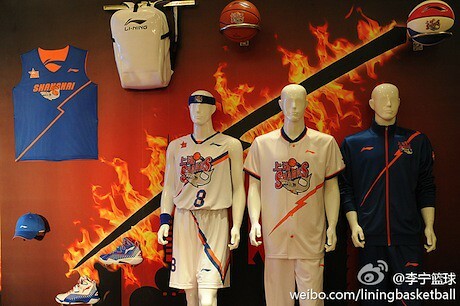 The deal between the Sharks and Li Ning is interesting because China ANTA has an agreement with the China Basketball Association to supply ANTA jerseys and shoes for every CBA team. 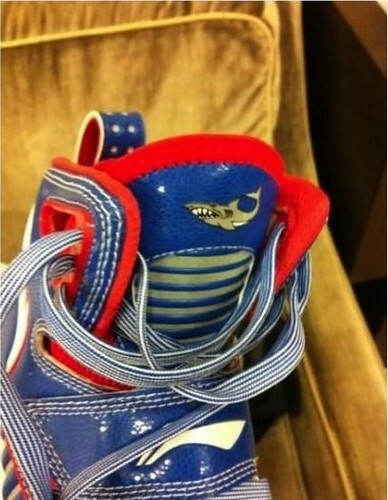 The Sharks will continue to wear ANTA gear on the court, but wear Li Ning off the court. The deputy general manager for the Sharks said that ANTA and Reebok were considered as potential partners, but the Sharks chose Li Ning because of their additional emphasis on the Sharks’ junior team, as well as their long-term vision for basketball development in the Shanghai region. For more photos and information on the deal, click here.